The ILRI project is featured in an UNEP booklet launched on Tuesday 19 October 2010 during the tenth meeting of the Conference of the Parties to the Convention on Biological Diversity, taking place in Nagoya, Japan. Securing sustainability through conservation and use of agricultural biodiversity: The UNEP-GEF contribution provides lessons from projects about useful tools for conserving and managing agricultural biodiversity over the long term. The report features project partnerships among UNEP, the Global Environment Facility (GEF) and national and international organizations conducted over the last 10 years. The ILRI-led and GEF-funded US$6.4-million Farm Animal Genetic Resources Project was started in 2009 to better conserve local breeds of chickens, goats and pigs that help sustain the livelihoods of poor farmers and the health and well-being of women and children in Asia. As much as 10 per cent of the world’s livestock breeds have disappeared in the last six years, due mostly to substitution or cross-breeding of local indigenous animals with exotic commercial breeds. Most of the extant indigenous livestock breeds today are found in pastoral herds and on small farms in developing countries. Understudied and insufficiently documented, many of the strengths and potential benefits of these tropical local breeds remain untapped. The Farm Animal Genetic Resource Project works to encourage wider use of local breeds, such as the Bengal goat in Bangladesh. Each of the four countries where the project is implemented has a long history of use of indigenous livestock and a rich diversity of animals, including the wild relatives of domestic livestock, which provide additional genetic resources for breeding programs to improve domestic animals. ILRI’s project partners include the Bangladesh Agricultural University; the Pakistan Agricultural Research Council; the University of Peradeniya, in Sri Lanka; and the Vietnamese National Institute of Animal Husbandry, with more organizations expected to join the project later. 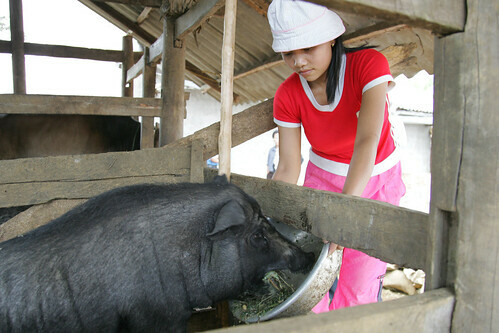 By the time the project is completed, in 2014, these partners aim to have developed breeding tools for use in low-input livestock production systems, cost-benefit analysis tools for comparing breeding programs for different indigenous breeds and populations, and analytical frameworks for assessing policy and marketing options for farm animal genetic resources. So far, with the input of local actors, including farmers, researchers and development agents, the Farm Animal Genetic Resources Project has developed baseline survey tools for assessing animal genetic biodiversity and constraints to its conservation. These tools will also be used to assess marketing opportunities for indigenous animals and the contributions these animals make to rural livelihoods. The project has also developed a flock and herd monitoring tool that helps to measure genetic and phenotypic diversity, to track genetic changes in livestock populations over time, and to capture the relations between indigenous domesticated animals and their wild relatives. Mohamed Ibrahim, ILRI’s coordinator of this Asia project, says that the project is increasing the capacity of local institutions to collect and analyse data related to indigenous livestock breeds. ‘Our goal,’ says Ibrahim, ‘is to ensure that important chicken, goat and pig breeds in the four targeted Asian countries are protected for the future benefit of local farmers’.